"Sing the nectarean names of Gauranga! O my Lord, please engage me in your loving service. Sing the nectarean names of Gauranga! Whether you are a householder or a sannyasi, constantly chant Hari, Hari! Forget about happiness and sorrow and fill your lips with hari-nama. You are bound up in an ocean of maya and forced to toil fruitlessly. But as soon as you come to your senses, immediately shout out the names of Radha-Madhava. Without serving the Lord of the senses (Hrsikesa) you are good as a dead man. 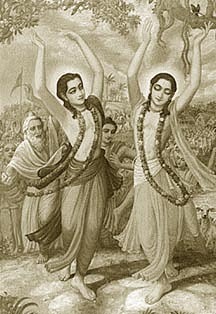 Take the advice of Bhaktvinoda Thakura: just once relish the nectar of the holy name."